In this guide, I will demonstrate how to compute a mean (average) variable from a set of variables in SPSS. 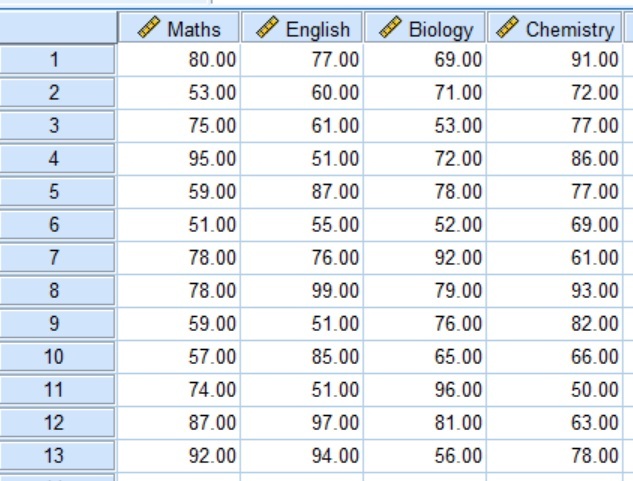 In this example, let’s say we have some scores (out of 100) on different college subject tests. 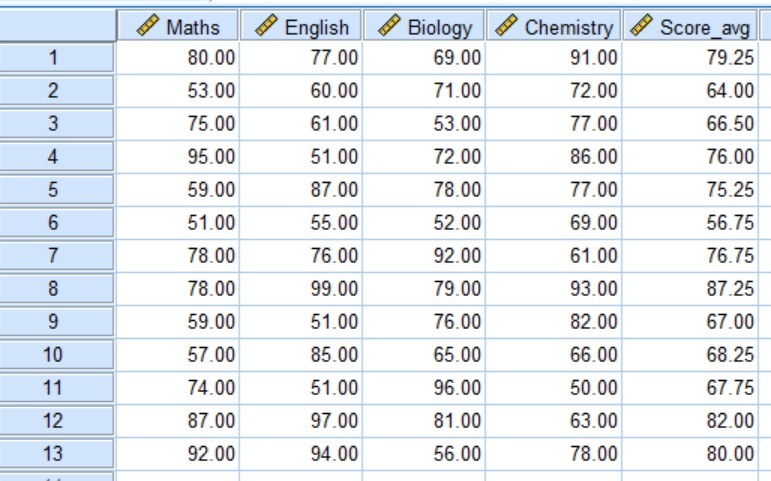 There are scores on Maths, English, Biology and Chemistry from 13 students. What we want to do is to average each student’s scores to see what their mean score is from the 4 subjects; thus, creating a mean variable. 1. In SPSS, go to ‘Transform > Compute Variable‘. 2. In the new Compute Variable window, first enter the name of the new variable to be created in the ‘Target Variable‘ box. Remember, SPSS does not like spaces in the variable names. A good example is to add the suffix ‘_avg‘ to the variable name to signify that it is a mean. 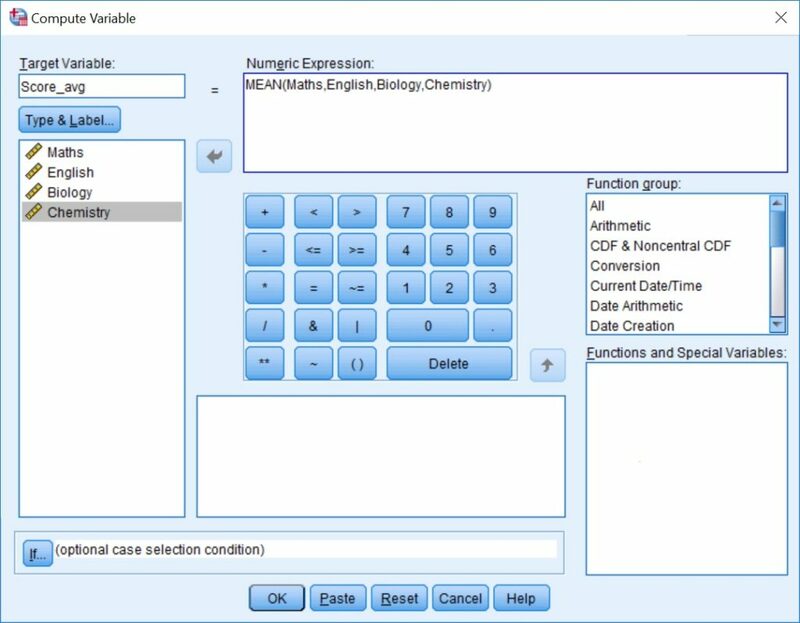 In the ‘Numeric Expression‘ box, enter the function ‘MEAN()‘. Within the brackets of the mean function, enter all of the variables to be averaged, separating each one with a comma. Ensure the variables are entered exactly as they appear in the SPSS datasheet. To avoid errors with typos, you can also double-click on the variables listed in the box to the left of the window. 3. Finally, click the ‘Continue‘ button to compute the mean variable. After running the MEAN compute function in SPSS, the new variable should be visible in the data sheet. This value will then be the mean of the variables entered into the function. In the example, this is the ‘Score_avg‘ variable. In this guide, I have described how to compute the mean of various variables in SPSS. Specifically, the ‘MEAN()‘ function is utilised in the Compute Variable option.